Pat Kelly has produced the fifteenth translation of The Skeptics Handbook — Cẩm Nang Của Người Hoài Nghi. Click on the cover to download a copy. The diacritical feast of glyphs in the file title looks like glorious unix nightmare. (So if the link doesn’t work for you, use the back up file here). Main thanks to my long suffering wife Thi Kelly who has been most painstaking in her efforts. Also thanks to Cam Ngo MSc MEngSc PhD (UNSW) who reviewed the text and offered helpful suggestions. Hope you get many downloads. Ralph at Kane TV in the UK, was, as always, a genius with the artwork, so that Vietnamese realists can enjoy a top quality production. Thanks to all the volunteers who make something possible that would otherwise cost hundreds or even thousands of dollars. 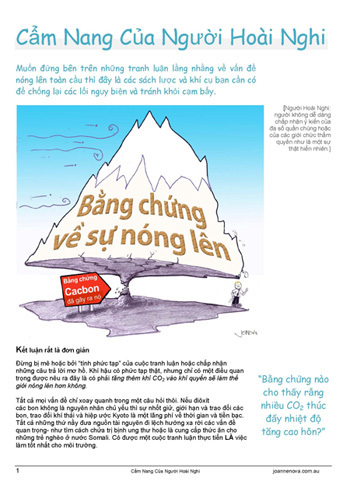 Climate: Khí hậu, Sceptic: người hoài nghi; Global warming: Sự nóng lên toàn cầu, Sự tăng nhiệt toàn cầu; Carbon dioxide: điôxít các bon; Climate science: Khoa học về khí hậu; Climate change: Sự thay đổi khí hâu, Greenhouse gases: Khí nhà kính; Gre enhouse effect: Tác dụng của nhà kính, Ảnh hưởng nhà kính. Volunteers have translated the first Skeptics Handbook into German, French, Norwegian, Finnish, Swedish, Turkish, Portuguese, Danish, Japanese, Balkan, Spanish, Thai, Czech and Lao. The second Skeptics Handbook is available in French and Turkish and Finnish. See all posts tagged Translations. Congrats Jo – a huge contribution to debunking the global bunk. There is a Vietnam minority in many countries including my home Czech Republic. Millions of Vietnam people live in foreign countries and their opinions affect these who are still in Vietnam very much. Then we who live in the countries should note people in editorial of their news magazines and other media that cover the word in Vietnam language for the minorities. They should spread links to the booklet. The Vietnamese have to be the worlds best networkers. Good luck with the storm and stay safe!!! Don’t do anything stupid that may endanger you or your families lives unintentionally. Awesome, I have some Vietnamese friends I can pass this on to! Well done to all those involved.